Ariana, one of my best friends from university, and I met up for dinner this past Friday to catch up at Cellar 58. I stumbled upon this awesome neighborhood gem while I was trying to find a good wine bar (I mean, what better way to pass the time with a really close friend than with glasses of delicious wine?) that also had a nice selection of dinner fare. Plus, the restaurant's prices were really reasonable, so I thought it'd be a good fit for us. Chef Fabio Bano from the exclusive hotel and private club, Soho House New York, has collaborated with the owner of Cellar 58, Maria Pezzella, to create the restaurant's offerings of Italian dishes (e.g., pasta, paninis, etc.). Chef Bano has already remade the dishes and menu at Cellar 58, bringing new specials that change daily. On another note, Ms. Pezzella was "one of the first people to represent international wines, working to introduce a broader palette of the world’s selections at a time when American wine lists were still very limited." 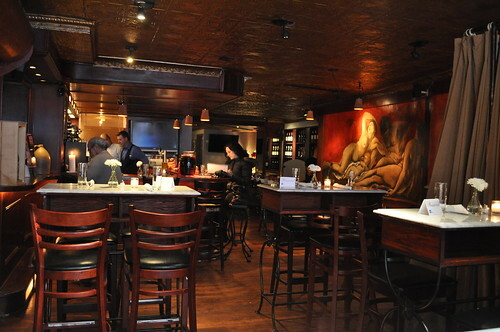 The combination of Chef Bano's culinary expertise along with Ms. Pezzella's 16 years of experience in the wine and restaurant industry has resulted in the lovely wine bar and enoteca (Italian for "wine repository") that is Cellar 58, offering creative and classic Italian tapas along with entrées that are to be enjoyed with the restaurant's extensive listing of wines. Inside Cellar 58. We sat at this nice table right by the window, making for really good lighting for my later photographs. 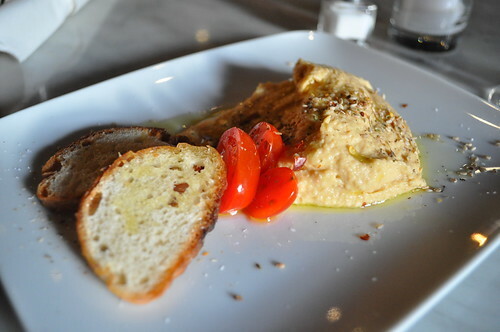 We started off the dinner with a plate of homemade hummus, and what a great starter! The hummus was the perfect consistency and had lots of flavor in addition to its staple seasonings of tahini, salt, and garlic. This particular homemade hummus had added sesame seeds, crushed red pepper, and other spices which added a kick of spiciness to an otherwise plain, garlicky hummus. It came with two crostini and a few sliced cherry tomatoes. But don't worry about not having enough crostini or carbohydrates to eat the hummus with! Our waitress gave us enough bread to finish up the last of it! After perusing the menu (and the waitress noting to us the kitchen was temporarily out of buffalo mozzarella) and hearing the day's specials (with our waitress emphasizing how the restaurant's house specialties offered daily) Ariana and I decided to go off the menu and to each try one of the specials offered that day. I went with the scallop special which came with homemade penne pasta, leeks, and cherry tomatoes in a light cream sauce. This was probably, hands down, one of the best pasta dishes I've ever had! You could definitely tell that the penne was made in house (so fresh! ), and the scallops were soft and melded really well with the cooked cherry tomatoes and leeks. 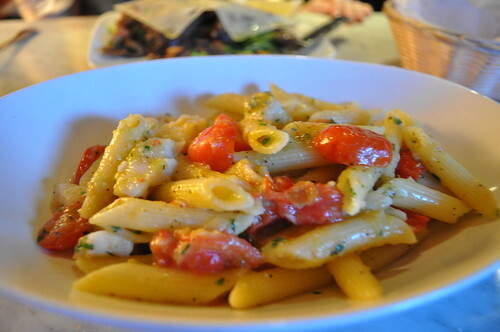 It wasn't overly creamy, which has been my main issue with many of the pasta dishes I've had at Italian restaurants, and the portion was perfectly sized, where by the end of the meal, I didn't feel overstuffed or bad for not finishing it all. Nothing beats a bowl of handmade pasta and fresh ingredients! 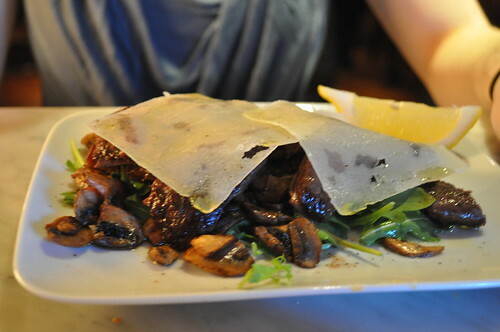 Ariana went with the skirt steak served with sautéed mushrooms, arugula, and slices of cheese (I believe it was provolone or mozzarella). The mushrooms were so good--really juicy and aromatic, which accented the steak. The texture of the steak was soft and had tons of delicious flavor, in the heartiest way. For dessert, Ariana and I shared the chocolate mousse with a lingue di gatto cookie, which is a traditional Italian biscuit. In Italian, lingue di gatto literally means "cat's tongue," and these cookies are thin, disk-shaped with a darker color around its circumference, with the color gradually turning lighter as it gets closer to the center. It was garnished with almond slices and confectioners sugar. It was really light and crispy, yet with an essence of almond. The mousse had a denser texture than I had anticipated--I was expecting something light and fluffy--but it was a dense texture that I really enjoyed. It was almost like gelato, without being all melted when exposed for a bit at room temperature. 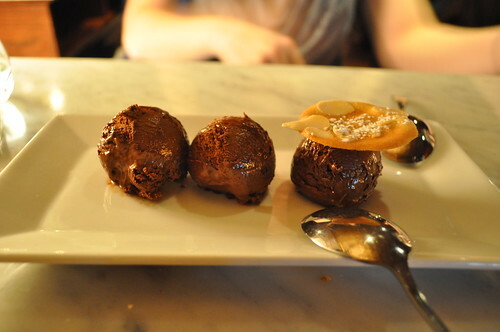 I wished there were a lingue di gatto cookie for each scoop of mousse--I like have a nice even ratio between different items on my plate (e.g., enough meatballs for a bowl of spaghetti, enough runny poached eggs for each bite of eggs benedict, etc.). 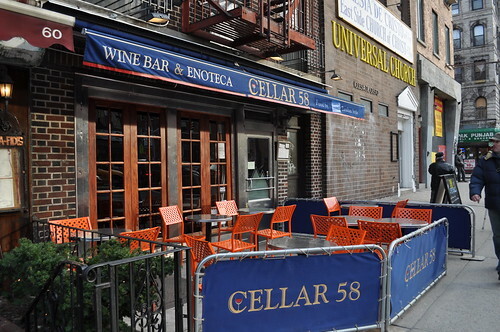 Findings: I was so surprised at how great the food was at Cellar 58. The reviews I had read raved about the wine (which we thoroughly enjoyed, too) and noted that the food was even better. It was something I had to see for myself, and sure enough, the kitchen at Cellar 58 proved the reviews to be keen and wise. I think my main problem with a lot of the usual Italian restaurants in the city, from what I've observed, is the overload in quantity (portion-wise) and sauce (marinara sauce with spaghetti instead of vice versa). It certainly wasn't the case at Cellar 58. The daily specials that we ordered were far from the typical dishes menu offerings (e.g., chicken parmagiana, penne a la vodka, etc.) --they were fresh, original, light, and perfectly portioned. 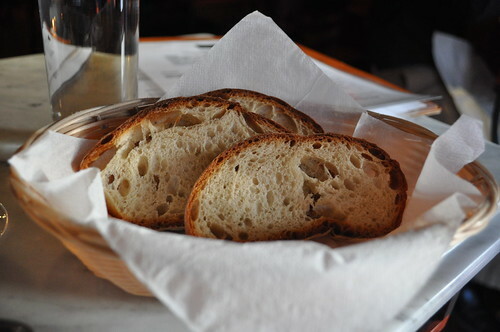 I also loved the homemade aspect of the dishes at Cellar 58--the homemade hummus, the house-made penne pasta. And Ariana's steak was so great with all those flavorful mushrooms! I would love to go back to try the Buffalo mozzarella truffle oil bruschetta when they'll be restocked with mozzarella along with any future daily specials offered by the kitchen. The prices were really reasonable for the quality and flavor of food we were getting, so it was definitely worth the trip there to catch up on old times! Price point: $6 for the starter, $18-22 for each main course, $7 for dessert.